The brain is the most complex organ in our body and is responsible for everything we do - every thought we have, action we take, memory we have and feeling we experience. This page gives an overview of the brain and some of the main areas within it. The brain is made up of around 100 billion nerve cells - each one is connected to another 10,000. This means that, in total, we have around a thousand trillion connections in our brains. These are ultimately responsible for who we are. Our brains control the decisions we make, the way we learn, move, and how we feel. What makes the human brain unique is its size. Our brains have a larger cerebral cortex, or cerebrum than any other animal (see Cerebrum section below). This enables us to have abilities such as complex language, problem solving and self-control. The brain is protected by the thick bones of our skull and a protective and nourishing fluid called 'cerebrospinal fluid' (CSF). It is separated from the rest of the body's blood stream by the 'blood-brain barrier', which also serves to protect the brain from infection and other substances in the blood. Read more about brain cells. The cerebrum is the largest part of the brain. It is split in to two 'halves' of roughly equal size called hemispheres. The two hemispheres, the left and right, are joined together by the corpus callosum. The right hemisphere controls the left side of the body and the left hemisphere controls the right side of the body. The brain stem connects the cerebrum with the spinal cord. It controls many of the functions we would not usually think about, including breathing, swallowing, blood pressure and digestion. The two main parts of the brain stem are the pons and the medulla oblongata. The pons takes its meaning from the Latin word meaning 'bridge'. It links together, or acts as a bridge between, different parts of the brain. The pons helps to relay information from the medulla oblongata to higher parts of the brain. 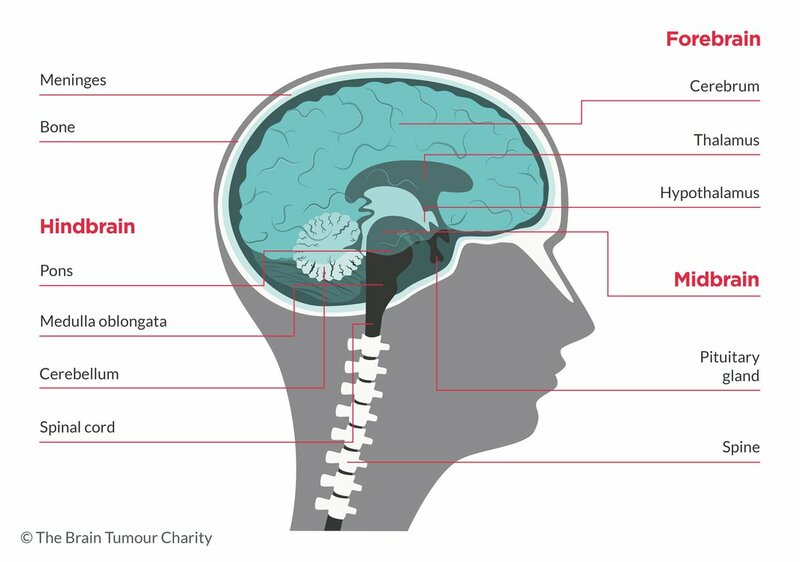 Childhood brain tumours in the brain stem usually originate in the pons. The medulla oblongata carries messages between the brain and the spinal cord. It is partly responsible for heart rate and lung functioning, and controls reflexes such as swallowing, coughing and the gag reflex. The spinal cord consists of all the nerve fibres that pass down from the brain to the different parts of the body. It is filled with cerebrospinal fluid (CSF), which nourishes and protects it. The meninges are a thin layer of tissue separating the brain from the skull. They are made of three sheets. Their function is to protect the brain. The cerebellum, also known as the hindbrain, is the second largest structure of the brain. It sits at the very back of the skull and plays a key role in our balance and co-ordination (which you may hear referred to as 'motor control' functions). The pituitary gland is a gland of the endocrine system. This means it is a hormone-producing gland. It is often referred to as the 'master' gland as it controls several other hormone-producing glands such as ovaries, testes and adrenals. It is made up of two main parts, the anterior (front) and the posterior (back), each of which releases hormones targeting different parts of the body. The pituitary gland works with the hypothalamus to control different functions of the body, such as heart rate and body temperature. This is an area of the brain whose primary function is the control of hormones. This is done by linking the nervous system to the endocrine system via the pituitary gland. Together, the hypothalamus and pituitary gland control the activity of most of the body's other glands. The hypothalamus regulates hormone levels by monitoring their concentration present in the body. Find out more about The human brain in the full fact sheet. 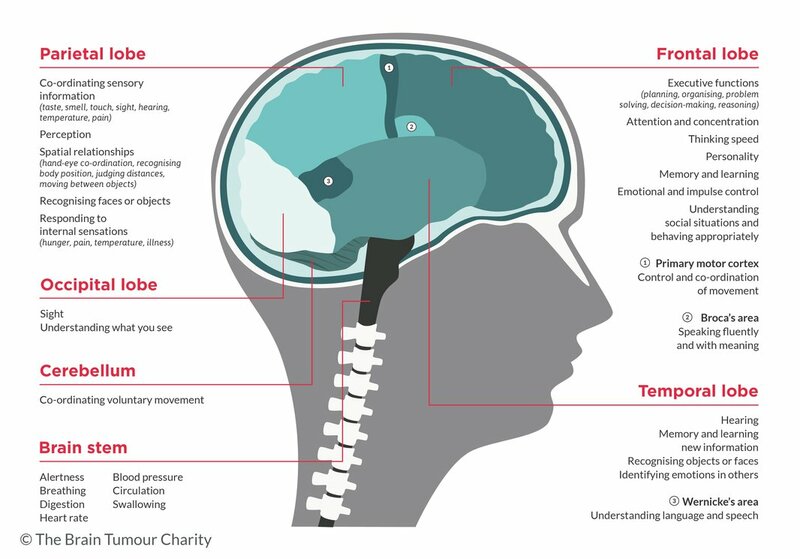 Find out more about The human brain in the full fact sheet - Clear print version, designed to RNIB guidelines.